A. Hilberer Magistère de Physique Fondamentale, Département de Physique, Univ. Paris-Sud, Université Paris-Saclay, 91405 Orsay Campus, France. G. Laurent Magistère de Physique Fondamentale, Département de Physique, Univ. Paris-Sud, Université Paris-Saclay, 91405 Orsay Campus, France. J. Bobroff Laboratoire de Physique des Solides, CNRS, Univ. Paris-Sud, Université Paris-Saclay, 91405 Orsay Campus,France. F. Bouquet Laboratoire de Physique des Solides, CNRS, Univ. Paris-Sud, Université Paris-Saclay, 91405 Orsay Campus,France. C. Even Laboratoire de Physique des Solides, CNRS, Univ. Paris-Sud, Université Paris-Saclay, 91405 Orsay Campus,France. M. Monteverde Laboratoire de Physique des Solides, CNRS, Univ. Paris-Sud, Université Paris-Saclay, 91405 Orsay Campus,France. Q. Quay Laboratoire de Physique des Solides, CNRS, Univ. Paris-Sud, Université Paris-Saclay, 91405 Orsay Campus,France. The current performances of single-board microcontrollers render them attractive, not only for basic applications, but also for more elaborate projects, amongst which are physics teaching or research. 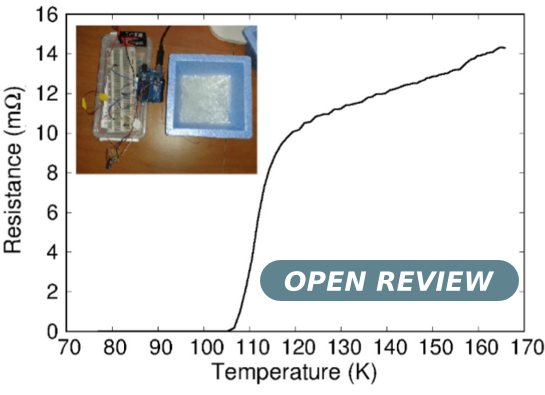 In this article, we show how temperature-dependent transport measurements can be performed by using an Arduino board, from cryogenic temperatures up to room temperature or above. We focus on two of the main issues for this type of experiments: the determination of the sample temperature and the measurement of its resistance. We also detail two student-led experiments: evidencing the magnetocaloric effect in Gadolinium and measuring the resistive transition of a high critical temperature superconductor. This paper, by A Hilberer, G Laurent, A Lorin, A Partier, J Bobroff, F Bouquet, C Even, J M Fischbach, C A Marrache Kikuchi, M Monteverde, B Pilette, Q Quay, is licensed under the Creative Commons Attribution License 4.0.